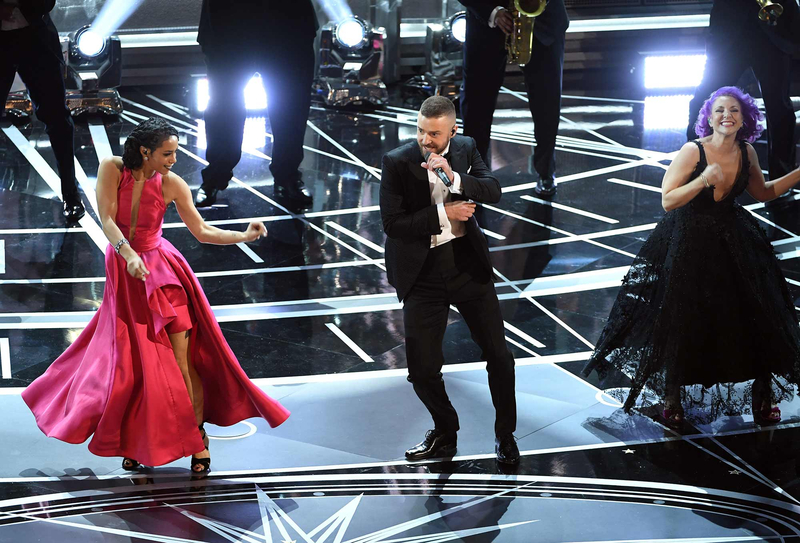 Justin Timberlake Opens the 2017 Oscars, Gets A-Listers Dancing with ‘Can’t Stop the Feeling’ — Watch Now! He’s got that good soul in his feet! Justin Timberlake kicked off the 2017 Oscars on Sunday, February 26, with his performance of “Can’t Stop the Feeling” — the tune that earned him his first-ever Oscar nomination for best original song. Watch a clip of his performance above! Follow Us Weekly’s live blog for winners, highlights, reactions and more! The 36-year-old started his performance from outside the Dolby Theatre, singing his way to the stage where he was joined by a gaggle of dancers dressed in their Oscar best. Timberlake segued into a rendition of Bill Withers’ ‘Lovely Day’ as he went into the front rows of the audience, where he even did a quick two step with wife Jessica Biel. Timberlake cowrote three other songs for the animated musical and produced most of the tunes for the soundtrack, which features songs by Ariana Grande, Zooey Deschanel, Anna Kendrick and Gwen Stefani. Check out the music video for “Can’t Stop The Feeling” here. Having won four Emmys and ten Grammys already, Timberlake’s Oscar nomination nudges him ever closer to the coveted EGOT — the holy grail for artists, in which they earn an Emmy, a Grammy, an Oscar and a Tony. Whoopi Goldberg, Mel Brooks and Audrey Hepburn are the most famous among the 12 luminaries who have received all four awards.